There's a gardener's saying that goes like this: “The first year they sleep, the second year they creep, and the third year they leap”. The first season after you plant a vine, it may appear to be asleep above ground. Rest assured though that below ground their roots are very much awake. And they are growing larger and spreading throughout the bed in search of nutrients. The second year, the year they creep, you will see additional growth above ground. This is because the roots are larger and can support a larger plant. Then, in the third year, when their roots are fully formed, the vine will seem to leap, assuming a fully mature size. We presently have three kinds of vines at the front fence, five Garlic vines (Mansoa alliacea) in one corner, a Maiden's Jealouy vine (Tristellateia australasiae) in another corner, and a Bauhinia kockiana in the center. 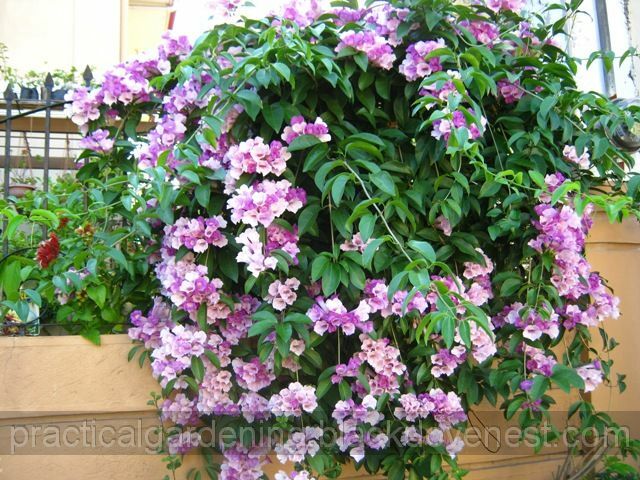 A fourth vine, a Rangoon Creeper (Quisqualis indica) actually grows in a garden arbor. The Garlic and the Maiden's Jealousy vines at the front fence are more than three years old and already "leaping". So you could imagine how vigorous their growth have become. The Bauhinia kockiana, meanwhile, is less than a year old and still in "sleep" mode. Here are the Garlic vines (Mansoa alliacea) as seen from the outside. From the outside, they are on the right side of the front fence. It's really a visual delight when in full bloom. And it doesn't fail to impress passerby with its flowers' various purple color tones. On the left side of the fence is the Maiden's Jealousy vine also known as Showers of Gold (Tristellateia australasiae). This particular vine flowers year round and is a favorite of the yellow banded bumblebee. The two photos above show how floriferous these vines could possibly be. But these views are only true on the outside. Inside the fence, you won't see much flowers. Here's how the Garlic vines look on the inside. There are five of these vines growing in that corner. And this is the Maiden's Jealousy vine as viewed from the inside. Notice there is less foliage on the inside. That is because I intentionally remove adventitious vine growth on this side (inside) of the fence. Pruning the vine at the outside is mainly done as a technique to promote continuous flowering. Removing adventitious buds or shoots is easy. Just scratch them off with your fingernail and they easily break off. This previous article shows how I pick off some adventitious buds growing out from a Rangoon Creeper vine. If you visit your garden everyday, these adventitious buds or shoots are easy to take care off. However, there may be times when you miss and the next time you see the vine, the shoots have grown into thick or mature branches too tough to break with your fingers. For these, cut them off with a pair of pruning shears. These practices have a couple of advantages. First, it thins the vines and promotes flowering on the other side of the fence. It is really a personal preference, but for me, the flowery display outside gives the house curb appeal. Second, the inside of the front fence remains tidy. This side doesn't look as crowded and I can appreciate the lawn and other plants inside the fence better. It also means I could plant other kinds of garden plants that border the inside of the front fence. So in effect, I have a totally different view of the garden inside and outside the front fence.